Despite intense diplomatic efforts on the part of Moscow to find a political solution to the Ukraine crisis, G7 leaders are not yet ready to welcome Russia back at the discussion table, German FM said, insisting on further steps to deescalate the crisis. 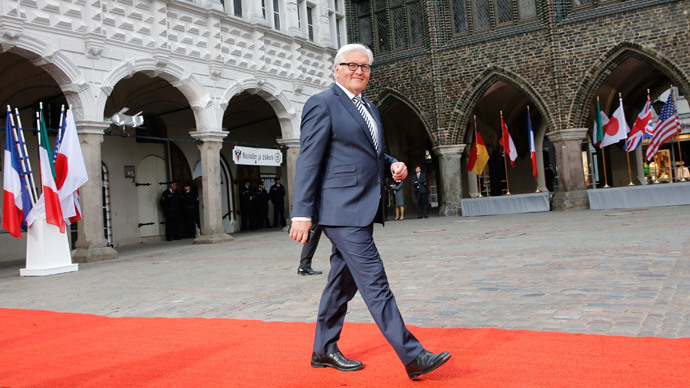 “I wish for Russia to return to the G8 nations but the way to get there hinges on its assistance and effort to put an end to the conflict in eastern Ukraine,”German Foreign Minister Frank-Walter Steinmeier said as the G7 (former G8) foreign ministers began to arrive in Lubeck. Speaking at an event with German students, Steinmeier said Russia’s participation is vital for solving a variety of international problems. Making it clear that Germany does not wish Russia to be excluded indefinitely, the minister also warned against further isolating Russia. “I have no interest in Russia being permanently isolated – we know from history that someone who is isolated can develop more dangerously than someone who is not,” he said. “We need very much Russia’s assistance in resolving such issues as Iran, Syria,” Steinmeier said. “These conflicts are impossible to resolve without Russia’s participation,” he stressed. The ongoing discussions surrounding the implementation of Minsk peace accords on Ukraine are “quite encouraging,” Steinmeier said following “very contentious” five-hour-long talks on Monday with his Normandy Four group counterparts from Russia, France and Ukraine. Meanwhile the foreign ministers of Britain, Canada, France, Italy and Japan have already arrived in Germany. Secretary of State John Kerry is scheduled to land on Wednesday to take part in a meeting ahead of the summit at an isolated castle in the Bavarian Alps on June 7-8. A day ahead of the ministerial gathering in Germany, Kremlin spokesman Dmitry Peskov made it clear that looking for solutions on global issues without Russia is futile and any resolutions of such narrow circle meeting would hardly be effective. “Naturally, the discussion of global issues without Russia’s participation can hardly be effective or lead to any type of action,” Peskov said, stressing that Moscow, as always, remains open to any format of discussions.